Double rook endings occur frequently and are different from single rook endings in several respects. However, there is much less literature on them. This DVD shall help filling the gap. Many guidelines remain valid of course like activity is the order of the day, the king wants to blockade passed pawns, the rooks does not and the rook belongs behind passed pawns be they friendly or enemy. But there are also many new motifs. Especially king safety plays a much larger role due to the increased firepower on the board. Therefore the value of extras pawns often also increases as they can provide the king with much needed shelter. 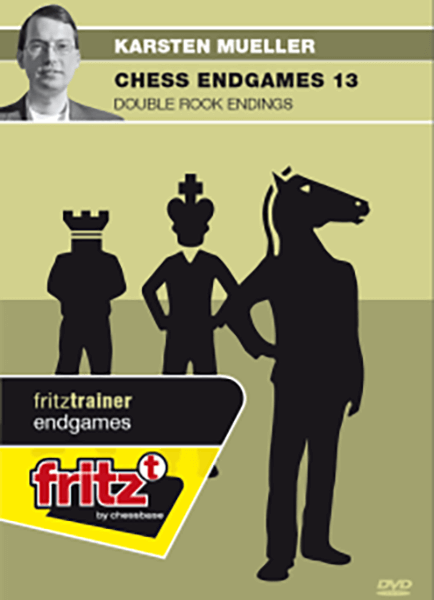 Furthermore the endgame expert discusses the question of the right exchange in detail, which crops up much more often than in single rook endings. So it is important to develop a good intuition, if the attacker or the defenders profits more from an exchange of a pair of rooks. Video running time: 4 hours 34 min.